Provides an excellent range of classy sounds, from finely-tuned variations on classic fuzz to blends with clarity. Wide range of fuzz sounds. Nice build. Reasonable price for a USA-made pedal. Darkglass' Duality takes its name from the fact that it contains two discrete fuzz circuits, exhibiting a similar underlying concept to the Frazz Dazzler but differing in the way it's presented, in that these two can be blended rather than switched. 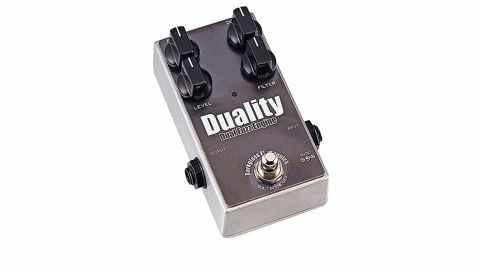 "You can go from a gated saw-tooth wave for a buzzy staccato to a high-gain fat sustaining fuzz"
From extreme left to extreme right on the duality knob you can go from a gated saw-tooth wave for a buzzy staccato to a high-gain fat sustaining fuzz that cleans up really well with guitar volume. All points between the two are available, making for interesting blends, but you can mix the dry guitar sound in for more variation - a blend knob mixes the clean input signal with the fuzz, working with the level knob that sets the volume of the fuzz signal. Add in the filter knob - an extremely wide-ranging tone control - and you have myriad tones to play with.